We provide complete construction services for various Plant Building; understanding and meeting the strict requirements necessary for multiple projects. This project included new construction of a 3,500 sq. 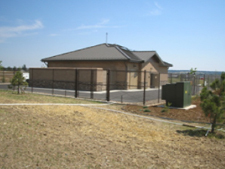 ft. water well collection station and treatment plant in Parker, Colorado including installation of water treatment and process piping. 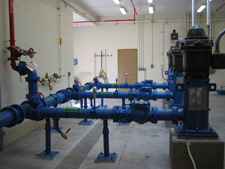 The large capacity water processing piping required precise placement and special valves and fittings. 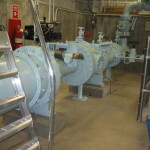 The three 75 HP large capacity vertical turbine pumps required installation with strict dimensional tolerances and performance tests were conducted after installation to ensure compliance. As the General Contractor, AGC coordinated multiple subcontractors for civil, mechanical, electrical, paving, and painting work. The project required unique coordination due to an extremely limited budget, strict completion schedule, and intensive submittal and review requirements. Despite significant weather conditions, including a winter weather state of emergency delay, AGC successfully completed this project within the constraints and to the complete satisfaction of the customer. 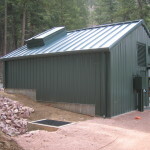 This project for Colorado Springs Utilities required unique coordination due to the complexity of this project and its confined site. The project was comprised of an 810 sq. ft. metal building on a structurally robust concrete foundation. The single 850 KW turbine generator is driven by water flowing through 24 inch penstock from a water storage reservoir located on Pikes Peak. The facility is unmanned and the equipment is remotely monitored and controlled. The earthwork on the project was technically complex and required an engineered shoring system due to the confined mountainous site, the steep hillside slope, and unstable soil conditions. With our Value Engineering strategies AGC saved the owner contract dollars and completed the project within the allotted time frame while maintaining exceptional quality. This Green Build will provide renewable energy to the Colorado Springs community for generations with very little maintenance. We could not have asked for a better product, a better price, or a better relationship with a contractor… we definitely intend to engage the services of Aztec General Contractors for future projects. From the onset I was immediately impressed by AGC’s organizational skills and the methodology the company had devised for undertaking this rather intricate project….This project has been riddled with numerous obstacles and countless unknowns, it was a distinct pleasure to work with such a competent, innovative group of individuals. Your staff has performed admirably providing quality and timely work on a variety of projects and they reflect a measure of your company’s diligence and dedication to assuring a ‘Job Well Done’. While we had a general idea of how we wanted the place to look, it was your team that helped make the vision a reality. Your team provided some expert advice and in the process showed us how we can get maximum value for our money. Aztec General Contractors, LLC is the finest of the bunch. I’ve had such a pleasure working with this firm because they are very schedule oriented, they coordinate issues extremely well, they focus on quality and they don’t cut corners at all. The ability of Aztec personnel to identify the necessary requirements and the initiatives to proactively act upon the delivery of those requirements, coupled with the highest levels of craftsmanship and professionalism proves Aztec to be an outstanding General Contractor for any construction project. Aztec provides highly knowledgeable staff that fully understand the requirements of their contracts and compliance with Davis-Bacon. Their level of quality control, safety, and craftsmanship are above par making them an outstanding contractor to work with. Aztec General Contractors, LLC (AGC) is a Colorado based general contractor specializing in federal, state, and local government contracts and commercial and industrial construction.